In the following, we take a detailed look at Scholly, addressing how it functions in addition to how legitimate it really is. By the end of this review, you should have a clearer idea about Scholly and whether it is a website you’re interested in trying out or not. We will also focus on any complaints or concerns frequently brought up by users in other Scholly reviews, to try and offer you a clearer look at this site. Some of these concerns include the pay-wall limit on finding scholarships and the inability to actually apply for scholarships through Scholly itself. The Scholly reviews will explain these concerns and point out any possible fixes, without forgetting to detail them. 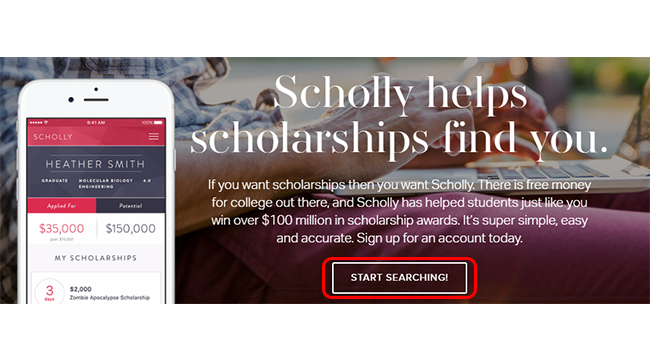 Scholly is a company that students, high school and college alike, can use to search for scholarship opportunities. It was created by Christopher Gray, who himself wanted to streamline the scholarship-searching process, so that is was easier on everyone. It can be compared to other scholarship search sites such as Cappex and Scholarship Owl. However, some of these other websites are free to use, while with Scholly, you have to pay a fee. Is Scholly Legit or a Scam? Since you do have to pay in order to use Scholly, it makes sense that some would initially suspect it of being a scam. However, if you look at any other Scholly reviews from its users, you will know immediately that it is legit. Not only do user reviews prove it, but the various media attention attests to Scholly’s legitimacy as well. It was featured on the program Shark Tank when it was just an app. Also, it earned a deal with Daymond John and Lori Greiner. It received its fair share of awards, and Scholly has even gained celebrity sponsorship from actor Jesse Williams. This may be the most important section in any Scholly reviews, so it is necessary to say that, without a doubt, Scholly is not a scam website. You will have to fill out a detailed profile such as what type of scholarships you’re looking for (merit or need-based), what your major is (or will be), and your GPA, in addition to identification information (e.g., gender, age). Users can easily access their accounts from their computer or a mobile device (iOS and Android). You can search for scholarship matches (but as of recent Scholly reviews, you cannot directly apply to them), keep track of deadlines, and even view free resources such as essays and advice. Scholly is not the website to go to in order to earn cash prizes or anything like that. Rather, it is a place to gain access to information about thousands of scholarships. So, when it comes to rewards, they are based on what you can find and what you actually apply to from there on. Free resources: By signing up for Scholly, you will gain access to materials such as award-winning essays and advice you might not receive anywhere else. This can help students that are working and planning to craft their own essays for scholarships. Access to thousands of scholarships: The primary purpose of Scholly is to compile and bring together the many scholarship opportunities into one place. Though it is not a guarantee you will receive anything you apply for, you are given the chance to find more scholarships that might interest you. You also learn how to apply for them, and increase your chances of earning money for college. Scholarship opportunities: Due to there being so many scholarships available, it can be overwhelming for students. With Scholly, the process is simplified, and you can rest assured that the information is constantly updated. Multiple devices: You can use Scholly on your Apple or Android devices, or on your laptop or desktop computer. This way, you can check your account and search for scholarship matches no matter where you are. Free resources: In addition to the scholarship opportunities, you also gain access to resources like advice and essays that you won’t usually find elsewhere. 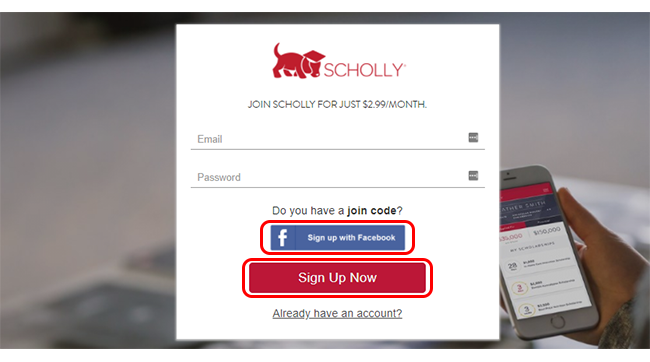 Monthly fee: Unlike other similar websites, there is a monthly fee of $2.99 to use Scholly. Some may not mind the fee, but some students feel it should be offered for free as not everyone can afford it. No way to apply: You can search for scholarships on Scholly, but you can no longer apply to them dirrectly from Scholly. There are not too many technical issues concerning Scholly. The major complaints about it stem from the fact that you have to pay to see any scholarship opportunities. Users are also none too pleased about the fact that you cannot apply directly from the website. Again, the latter is true and still standing as of this Scholly review. There are many that consider that the monthly fee is more than decent and that it ultimately help you gain more money in the end. Nonetheless, the company does claim to be looking for sponsors or other ways of making it completely free. Also, they are working on making it possible to apply directly from the website itself. With that said, the only way to resolve this is to wait for Scholly to update its systems. Email: You can email Scholly at info@myscholly.com. Contact form: On their website, you can fill out a contact form to get in touch. Social media: Scholly can be found on Twitter, Facebook, and Instagram. App: You can check out the Scholly apps from the App Store and the Google Play Store. Scholly is an innovative program designed to help streamline the search for scholarship opportunities for students. In spite of having a monthly fee, it’s a legitimate program with backing from media outlets, entertainers, and many other user Scholly reviews. If you already used or are using Scholly, feel free to share your experience in the comments. Looking to try out a survey or testing website as well? Then simply check out the following and take your pick!